We recently ran a piece on the building of the first stone London Bridge (see our earlier post here) and so we thought it timely to take a look at the life of the builder, priest and ‘architect’ Peter de Colechurch. Not a lot is known about the life of de Colechurch – although we do know he took his name from the fact he the chaplain of St Mary Colechurch, a church which once stood at the junction of Poultry and Old Jewry (and was destroyed in the Great Fire of 1666). The stone London Bridge wasn’t his first attempt at bridge-building – in 1163 he had supervised the rebuilding of the wooden London Bridge after a fire some 30 years before. His role in building the subsequent stone bridge remains a little unclear but he was known to have been in charge of the building works themselves and also headed the fundraising and it is believed he headed a guild responsible for the upkeep of the bridge known as the Fraternity of the Brethren of London Bridge. His seal depicts a priest celebrating mass at an altar with the Latin Sigillum Petri Sacerdotis Pontis Londoniarum (Seal of Peter Priest of London Bridge). The chapel on the bridge was dedicated to St Thomas á Becket and it’s suggested that he and de Colechurch would have known each other – Becket had been christened at St Mary Colechurch in 1118. Sadly, de Colechurch did not live to see the stone London Bridge completed – he died in 1205 and was buried under the floor of the chapel on the bridge. Some bones in a small casket were disinterred in from the chapel undercroft in 1832 – now in the Museum of London, these were rumoured to be those of de Colechurch although after analysis the bones were found to be part of a human arm bone, a cow bone and goose bones. (Other accounts suggest most of Peter’s bones were tossed into the Thames and a small number sold at auction). 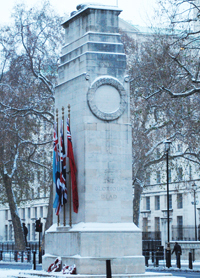 We’re looking at some of London’s World War I memorials so it’s only fitting we look at the life of acclaimed architect Sir Edwin Lutyens, the man credited with designing the Cenotaph – the UK’s national war memorial – in Whitehall (pictured below). Lutyens was born in London at 16 Onslow Square, South Kensington, on 29th March, 1869, and – the ninth son and 10th of 13 children of soldier Captain Charles Lutyens and his wife Mary – was named for painter and sculptor Edwin Henry Landseer, a friend of his father’s. He grew up in London and Surrey and in 1885 commenced studying architecture at the South Kensington School of Art. In 1887, he left before completing the course, briefly joining the practice of Ernest George and Harold Peto before starting his own practice in 1889. Early commissions included country houses and it was during this period that he met with mentor and landscape gardener Gertrude Jekyll, a relationship which led him to design her home, Munstead Wood near Godalming in Surrey. In 1897, Lutyens, known familiarly as ‘Ned’, married Emily Lytton – daughter of the late Viceroy of India and first earl of Lytton, Edward Buller-Lytton – and by 1908 the couple had five children. The family’s London addresses included 29 Bloomsbury Square (which also served as his office), 31 Bedford Square and 13 Mansfield Street, Marylebone, while his offices were located in numerous places including at 17 Queen Anne’s Gate. Lutyens continued designing country houses – he eventually designed more than 35 major properties and altered and added many more – and among his commissions were Castle Drogo in Devon and the refurbishment of Northumberland’s spectacularly sited Lindisfarne Castle – both now National Trust properties. He was also involved in helping to plan and design Hampstead Garden Suburb in London, work which included designing two churches. In 1912, Lutyens was invited to advise on the planning of the new Indian capital in New Delhi and his most important contribution was the design of the Viceroy’s House which combined elements of classical architecture with traditional Indian decoration. He was knighted in 1918 for his contributions in India and for his advice to the Imperial War Graves Commission. It was his role in this latter effort which led to his becoming a national figure. He was involved in the creation of numerous monuments to commemorate the war dead, the best known of which are the Cenotaph in Whitehall – initially commissioned as a temporary structure (see our earlier post here) – and the Memorial to the Missing of the Somme in Thiepval in northern France as well as the Australian War Memorial at Villers-Bretonneux and the Anglo-Boer War Memorial in Johannesburg. He also designed more than 100 war cemeteries in France and Belgium and other war memorials – including overseas in places like Dublin – as well as London’s Tower Hill Memorial (see our earlier post here). Other London buildings he designed included the headquarters of Country Life magazine in Tavistock Street, Britannic House in Finsbury Square, the head office of the Midland Bank in Poultry and the Reuters and Press Association headquarters at 85 Fleet Street (now home to the Lutyens Restaurant, Bar and Private Rooms). Lutyens was elected a fellow of the Royal Academy in 1920 (he was later president) and in 1924 was appointed a founding member of the Royal Fine Arts Commission. Even as he continued work in Delhi, he took on other commissions – such as the British Embassy in Washington, DC – and in 1924 he completed one of his most lauded – and smallest – designs: that of the one twelfth scale Queen Mary’s Dolls’ House which was shown at the 1924 British Empire Exhibition at Wembley and which can still be seen at Windsor Castle. In 1929 Lutyens was commissioned to design a new Roman Catholic Cathedral for Liverpool but when he died on 1st January, 1944, this work was still unfinished with only the crypt completed thanks to the outbreak of World War II broke. Lutyens’ funeral was held in Westminster Abbey a few days later and his ashes were subsequently placed in the crypt of St Paul’s Cathedral. For more information on Lutyens’ life and works, check out The Lutyens Trust, founded in 1984 to preserve and protect his legacy. One of the major thoroughfares of the City of London, the name is reflective of its role as a marketplace with the medieval English word ‘cheap’ generally been taken to mean market. Starting from the intersection of Newgate Street and St Martin’s Le Grand through to where it runs into Poultry, the street was apparently originally known as Westcheap – Eastcheap is still located down near the Monument. Cheapside’s surrounding streets – including Poultry, Milk Street, and Bread Street give indication of the sorts of goods that were once sold in the area. 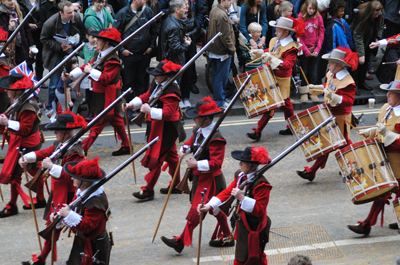 Cheapside was, in medieval times, an important street and was on the processional route royalty would have taken from Westminster to the Tower of London. It is the site of St Mary-le-Bow Church (it’s said that if you’re born within hearing of the Bow bells you’re a true Londoner), and, until the Great Fire of 1666, the eastern end of Cheapside was the site of the end of the Great Conduit where water arrived after being piped in from the Tyburn River in the west. Key figures associated with Cheapside include slain Archbishop of Canterbury Thomas Becket, born there in 1118, poet John Milton, born on the adjoining Bread Street in 1608, and writer Geoffrey Chaucer. A glimpse into the street’s past was found in 1912 when the Cheapside Hoard was unearthed during the demolition of a building there (you can see our earlier post on that here). The area was heavily bombed during World War II. Lined with shops, restaurants and office buildings, Cheapside today remains close to the heart of the city and is currently undergoing significant redevelopment, the recently opened swanky shopping centre at One New Change being an example.